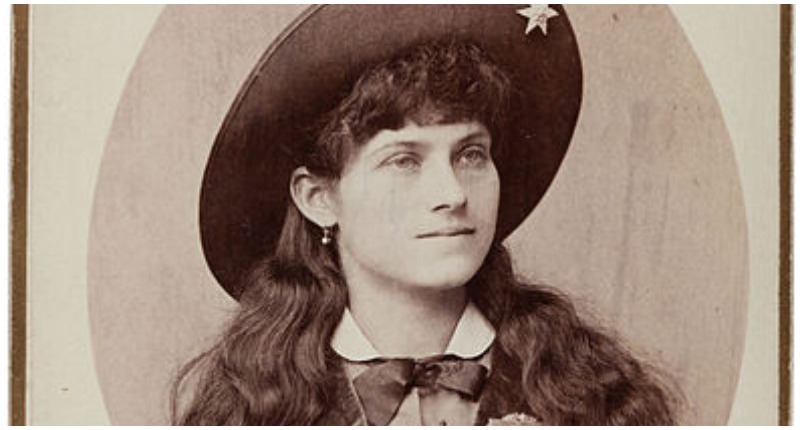 A sharpshooter who toured with none other than “Buffalo Bill” Cody’s Wild West show, Annie Oakley is renowned as a star and has obtained legendary status in American history. 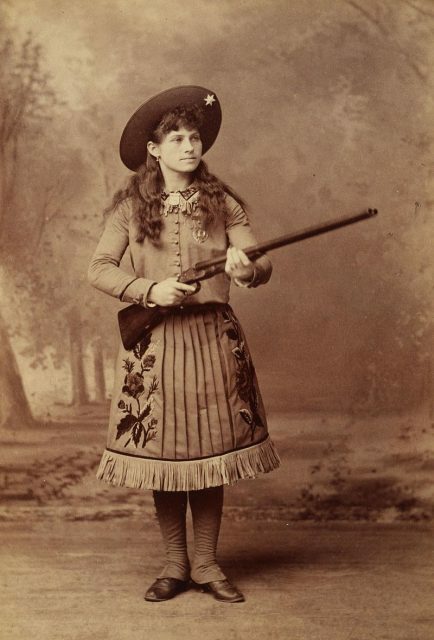 But who was Annie Oakley really, and how did she come to play such a prominent role? Oakley was born in Ohio in 1860 as Pheobe Ann Mosey – the sixth of a total of nine children in her family. Her parents, Susan and James, were Quakers, and her father fought in the War of 1812. Unfortunately, he died of pneumonia when Annie was only about 6 years old. Her mother remarried about a year later but was widowed once again shortly thereafter. 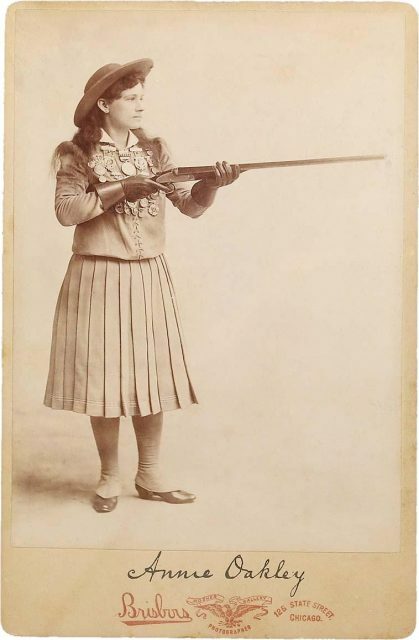 Annie Oakley Cabinet Card Signed. With the death of her father, and stepfather, Annie, at the age of 9, was admitted to the Darke County Infirmary, together with an older sister, Sarah Ellen, where she was put into the care of Samuel Edington, the superintendent, and his family. Putting children into care to alleviate a family’s financial restraints was not unusual at the time, but that did not make it easy on the children. While at the infirmary, she learned to sew, received some education, and helped look after the Edingtons’ children. In the spring of 1870, when she was only 10 years old, Annie was “bound out” to another family to help take care of their baby, but the family proved to be abusive, and even put Annie outside in the cold without shoes when she fell asleep while doing some mending. In her autobiography, Annie referred to them as “the wolves”, although she graciously never revealed their names – an indication of her character. To support her family both before and after she went into care, Annie started hunting by the age of 8. She often sold game to shopkeepers in nearby Grenville, as well as restaurants and hotels in northern Ohio. 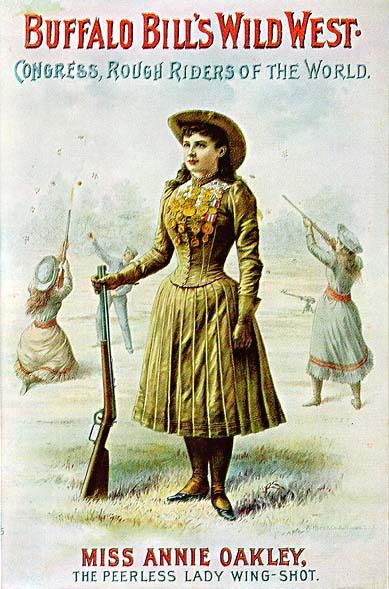 Annie was invited to Cincinnati to compete in a shooting match against Frank E. Butler – a travelling marksman who was performing in the city with the Baughman & Butler shooting act. He placed a $100 bet on each side (roughly $2,282 in 2018) with a hotel owner, Jack Frost, that he could beat any local shooter. Frost invited Annie to attend, stating “the last opponent Butler expected was a five-foot-tall 15-year-old girl named Annie.” On Thanksgiving Day in 1875, Butler lost the bet to that young girl, missing his 25th shot. 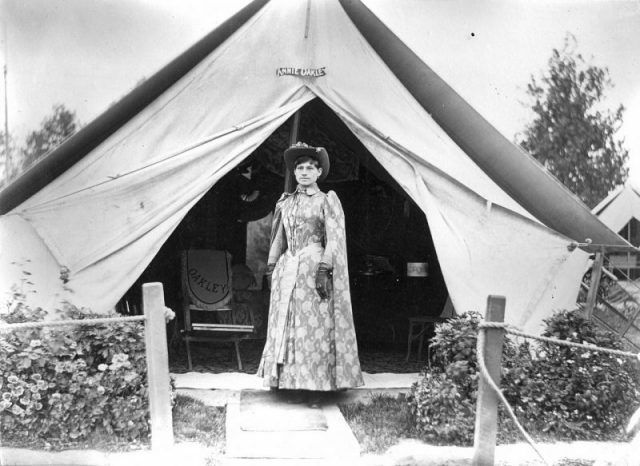 When she and Frank began to tour together, along with her dog, George, Phoebe Ann Mosey adopted the stage name of Annie Oakley, perhaps after the neighborhood in Cincinnati where they lived. When Sitting bull saw her at a theatre in St. Paul, Minnesota, he was so taken with her that he gave her the moccasins he had worn at Little Bighorn, and named her “Watanya Cicilla” – Little Sure Shot. In 1885, Annie and Frank joined Buffalo Bill’s Wild West Show and toured with the troupe for 16 seasons. Annie was quickly the main draw, receiving top billing and her image on promotional posters. As a result, Frank began acting more as her manager than performing partner. 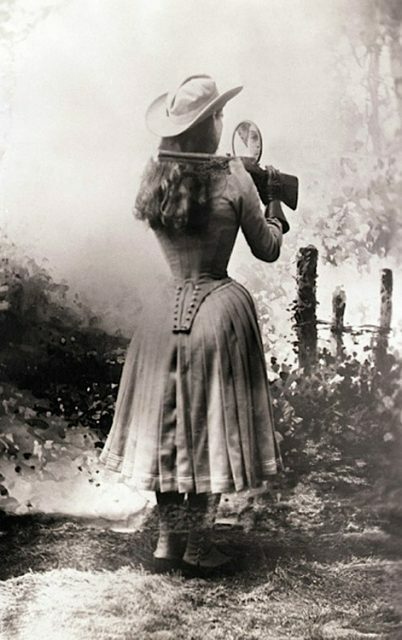 Together, they traveled to England for the Golden Jubilee of Queen Victorian in 1887, which only increased Annie’s celebrity, along with her growing pile of medals, trophies, and awards for her shooting. The Wild West show toured Europe in 1889, staying in Paris for a six-month stint before traveling to other regions of France, Italy, Spain and Germany. When the show finally returned to the US after 2 more tours of Europe in 1892, Annie was a household name. She and Frank bought a home in New Jersey, although they continued to tour to roughly 130 venues per season. In 1894, Thomas Edison himself filmed members of the show; now anyone could go to a nickelodeon and see Annie shoot. Like most performers, however, Annie’s time on stage had to end eventually. When she was 41, the train that she and Frank were on collided head-on with another, and Annie was badly injured. Although she recovered from her temporary paralysis and endured 5 spinal operations, she left the Buffalo Bill show in 1902, opting to perform in The Western Girl – a play written just for her. 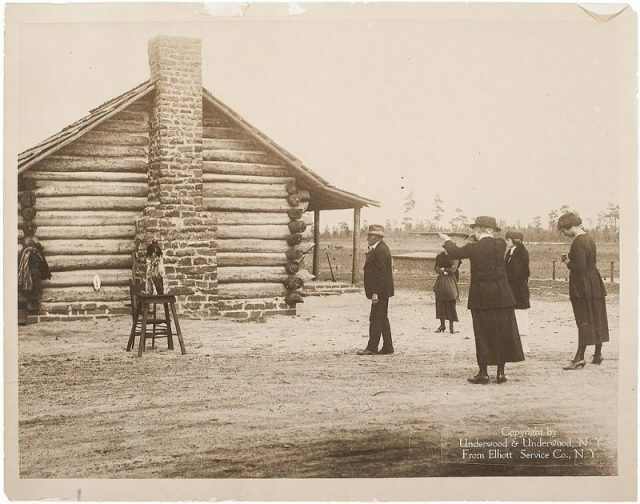 In 1912, Frank and Annie built a home in Maryland known as Annie Oakley House today, before moving to North Carolina in 1917. 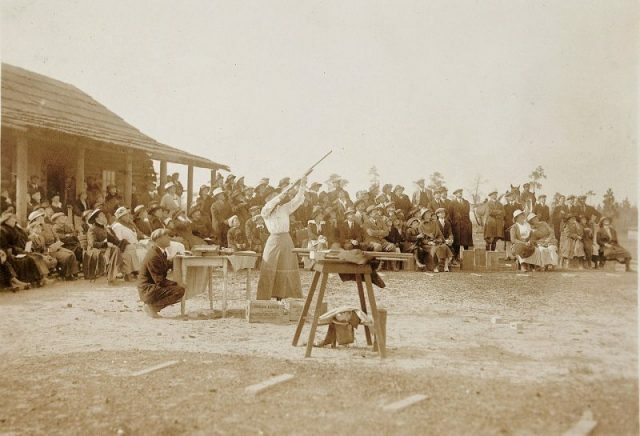 She continued shooting and setting records well into her 60s, but her health declined after a car accident in 1922, and she died of pernicious anemia at the age of 66. Her husband – devoted to her for over 50 years – died a mere 18 days later. 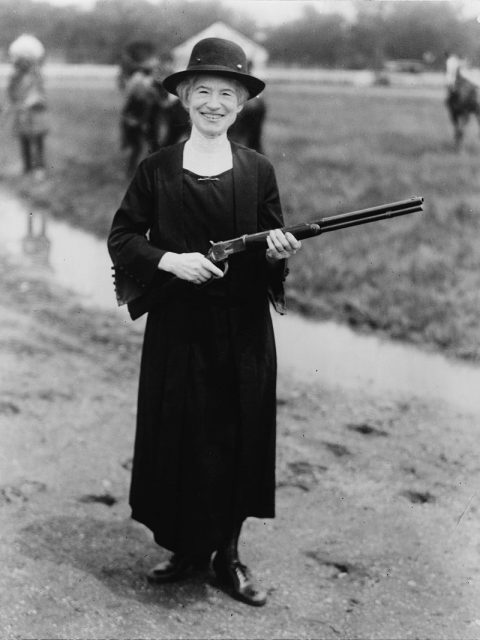 Throughout her life, Annie used her fame to prove that women could shoot, and shoot well, in a male-dominated field, while still being women. She wore a dress, made her own costumes, and embroidered in her spare time. In 1917, during the First World War, she contacted the US Secretary of War with a similar offer. When she did not hear back, she instead visited army camps, raised money for the Red Cross, and volunteered with other military charities. 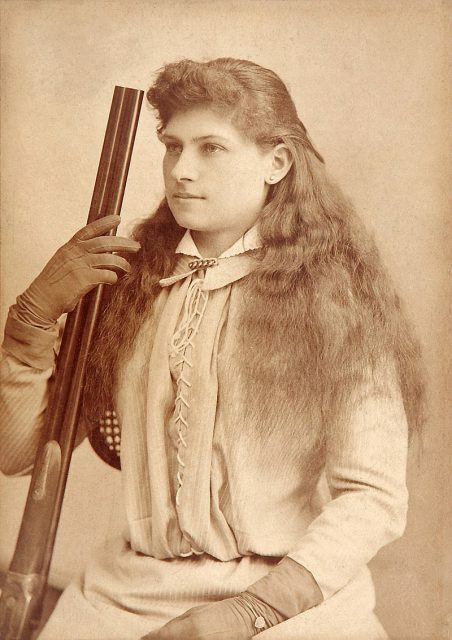 Ahead of her time with regard to women, shooting and combat, Annie Oakley became an American legend and an icon. Her celebrity continues to this day, in museums, books, theatre, movies, and television. Not bad for a poor little girl from Ohio.